I’ve been feeling celebratory, now that my book Forest of Shadows is just weeks away from being released (and it’s available now for pre-order). So, what better way to revel in my happiness than subject myself to a tattoo? Actually, the pain isn’t bad at all. Reflexology is far more painful. I swear. It’s horrendous. It took me a while to come up with something ‘writerly’ themed, and my wife pointed out words I had recently used myself to put under the image; Never Give Up. So true. I’m a firm believer in the Cool Hand Luke theory of life. If you want to do something, just do the damn thing and never, ever quit. Huge thanks to Darren at Rising Dragon Tattoos in NYC. He has a great shop and is a damn good artist. He now has a customer for life and I urge anyone in the area looking to get ink to go there. The Captain America shield has been sitting on my arm for years and didn’t even get me a free ticket to the movie. I have a question for anyone reading this. 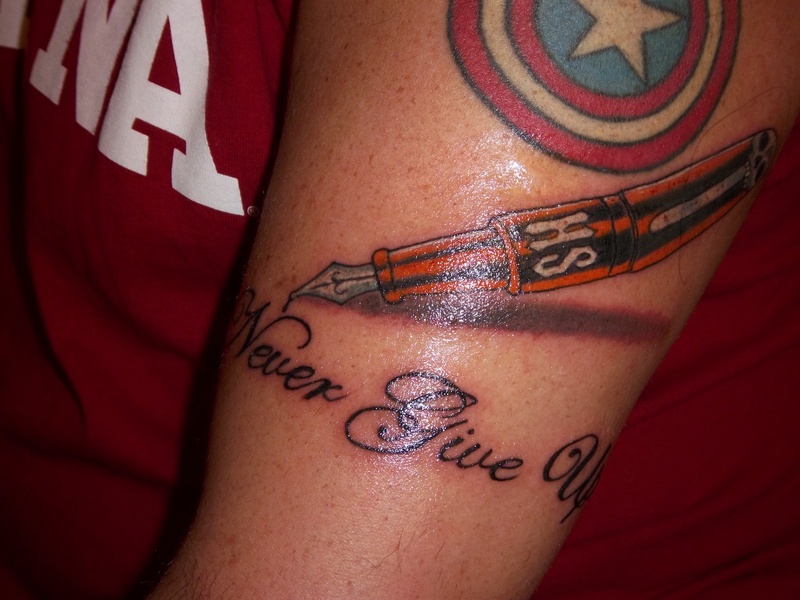 How many times do you get ‘stabbed’ by a tattoo needle per hour of work? Just curious. Hit the comment bubble to send in your guess, informed or otherwise. Also, what kind of ink do you have? Couldn’t even begin to guess. Do you know the answer? Because I’d be curious as well. Congrats on the new ink. I have a few and have considered a “writerly” new one, myself. Just have to wait and see. Love your new tat. I keep putting off getting one. Maybe because I think the answer to the question is about 3,000 hits per hour when getting one done. Congratulations and best of luck with the new book. Thanks Scott. To think that I may have been stabbed 6,000 times makes my head spin. LOL And here I am planning the next one. Glutton for punishment. Hope all is well with you! Dig the new ink! Can a full back tattoo be too far behind?